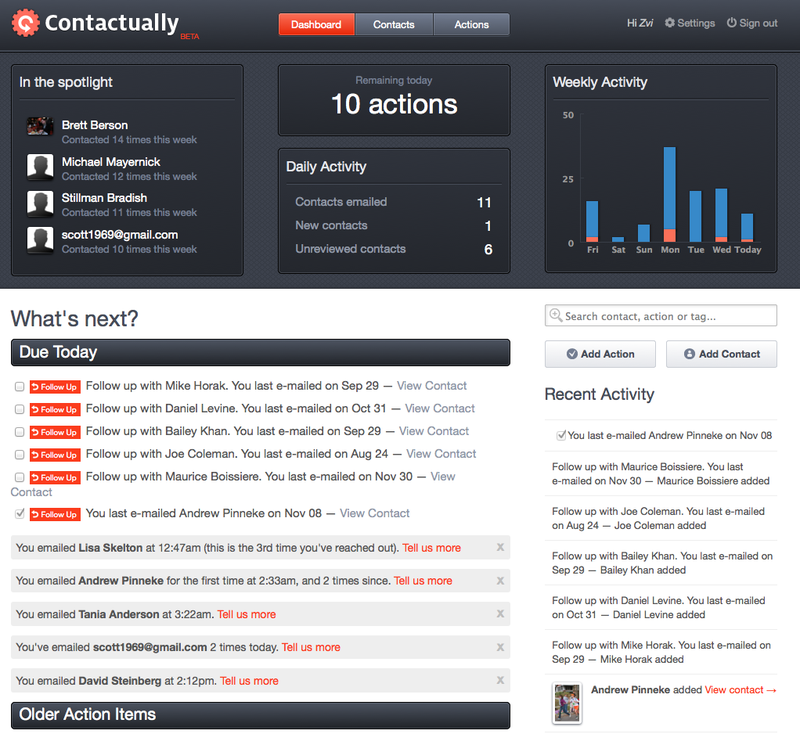 Contactually, a 500 Startups-backed company, is today launching its lightweight CRM solution for email users. At present, the service works with any IMAP-connected account, including Gmail, Google Apps, Yahoo, AOL and others, but it will support both POP3 and Microsoft Exchange in the near future. The company also just closed an angel round totaling $165,000, which is in addition to the $50K it had in seed funding. When you sign up for Contactually (which I did, using Gmail OAuth – it doesn’t ask for your username and password), the service adds information pulled from social services, including Facebook, Twitter, LinkedIn, Klout, Quora, Flickr, Foursquare, Tumblr, Skype and dozens of other networks, and integrates those into your new online address book at contactually.com/contacts. Here, your contacts’ name, info and details are listed, in addition to links to their accounts on the 20+ supported social services. 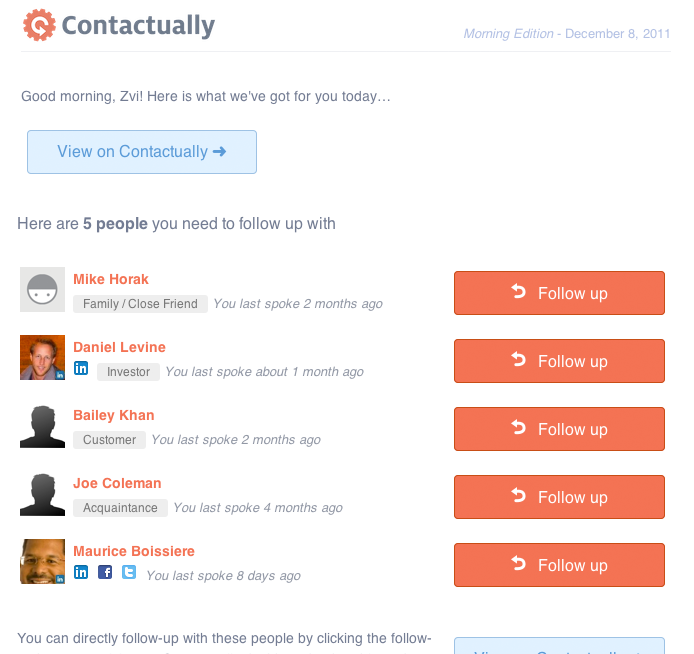 Contactually also tracks how often you’ve contacted them, when, and the contact’s priority, among other things. In some ways, that part of the service is a bit reminiscent of Rapportive, the Gmail widget which provides contextual information about those who you’re emailing with. Contactually, too, will launch its own Gmail widget in the future, co-founder Tony Cappaert tells me, given that a good 70%-75% of its current user base is on Gmail/Google Apps. (The service has been in private beta with hundreds of testers prior to today’s launch). But Contactually aims broader than just a widget – it’s intended as a CRM solution. To this end, the key part of its service are its “Actions” – reminders to reconnect and follow up with your contacts. These appear on the online dashboard and arrive – how else? – via email. Users can control how often (or whether) they want to receive these emails (e.g. daily, weekly) which are, by default, set to arrive once in the morning with tasks and actions, and once in the evening with details on new contacts. What’s neat about using Contactually is that you don’t have to go to the website to perform many of the necessary actions. Instead, in the email that it sends, you can click a button next to the person’s name (the one you’re being reminded about) in order to email them directly. And in the evening summary email, you can just reply to Contactually’s email itself to provide extra info about the contacts it has discovered. For example, “follow up with Bob in a month.” Contactually can parse your text and make the necessary changes online. That part seems a little too good to be true – can I really just write “follow up with Boby in a month” and have a service understand me? Apparently so. The updates aren’t always immediate – if it can process the note or action with its natural language processing (NLP) engine, then it’s automatic. Otherwise, it can take a few minutes to a few hours before you see the change appear on the website. Finally – and this is also key to Contactually’s overall strategy – the service is designed not to replace, but to supplement enterprise-grade CRM systems. It comes in through the back door via its users, very much like how Google Apps sneaked in under I.T.’s nose. Users can take advantage of Contactually’s ease-of-use, while having all the data synced back to their company’s “official” CRM solution like Salesforce or Highrise. Eventually, Contactually will charge for its (likely freemium) service, but pricing is still being ironed out. Although the service is launching publicly now, it’s metering access for the first month or so. TechCrunch readers can get in now, however, using the invite code “techcrunch.” (First 2,000 only). Contactually was founded by Zvi Band, Tony Cappaert, and Jeff Carbonella, and is based in Washington, DC. In addition to the $50K in seed funding from 500 Startups, Contactually’s angel round of $165K included investors Sean Glass and David Steinberg. You can sign up for Contactually here.